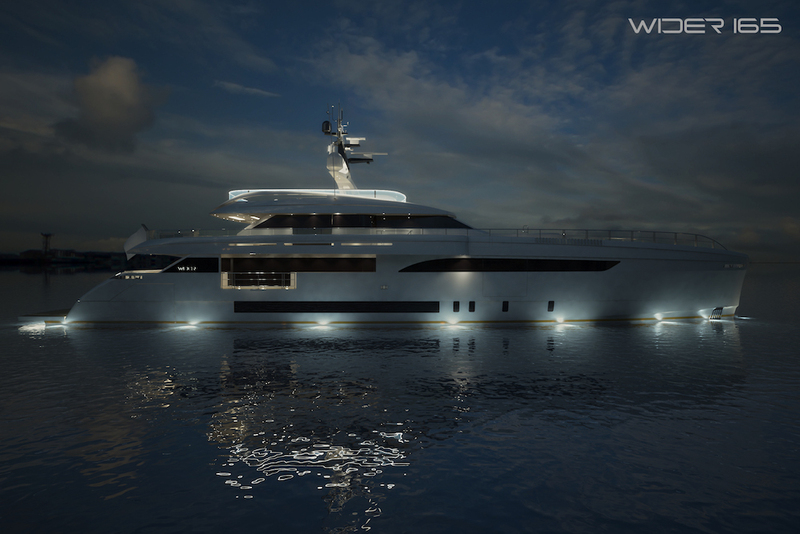 Constructed entirely in aluminum, the elegant profile of the WIDER 165 was created by yacht designer Fulvio De Simoni in collaboration with WIDER Founder and CEO Tilli Antonelli and the in-house WIDER design team. The WIDER 165 has been designed to enhance the owner’s contact with the sea, while significantly increasing interior volumes compared to other similar sized motor yachts. 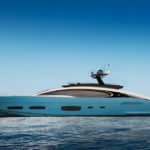 “Our goal is to give each and every owner exactly what they desire, creating a yacht to suit their unique personality” says WIDER Founder and CEO, Tilli Antonelli. The 50-meter aluminium superyacht presents the same elegant lines as the WIDER 150, while adding significant interior volume and exterior living space. The 165’ accommodates a touch-and-go helipad, a dedicated submersible bay and offers a beach club that is fast becoming the trademark of the WIDER superyacht range including the covered swimming pool. Thanks to its Floating Launching System, the stern of the WIDER 165 can be converted into a spacious garage ideal for carrying the WIDER 32 as a tender – the transom opening allows the WIDER 32 to be housed in the same space used as a swimming pool. 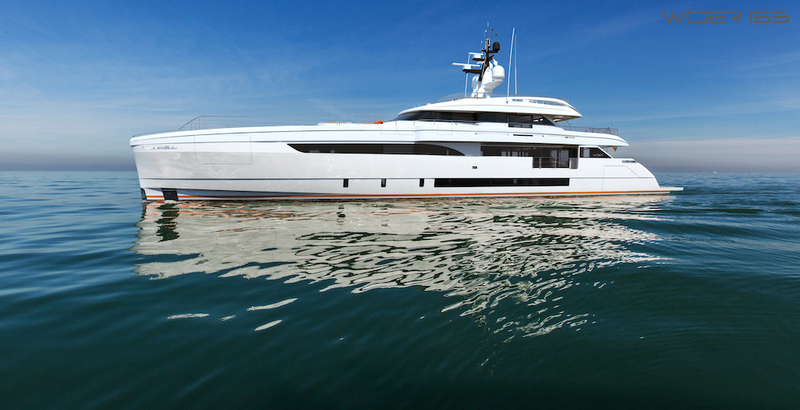 The beating heart of the WIDER 165’ project is its diesel electric propulsion system combined with a 544kWh Lithium polymer battery bank and Azimuthal pods, which guarantees hugely reduced fuel consumption. The traditional engine room has been replaced by a Power Generator Room, located in the bow. This leaves the mid ship of the vessel free for larger, more comfortable guest cabins located in the most stable part of the yacht. This arrangement is only possible because of the use of Azimuthal pods which receive power through an electric cable unlike traditional propulsion systems which have shafts. A range of 3,600nm is expected at a cruising speed of 13 knots, increasing to 5,600nm at the economical speed of 10 knots. 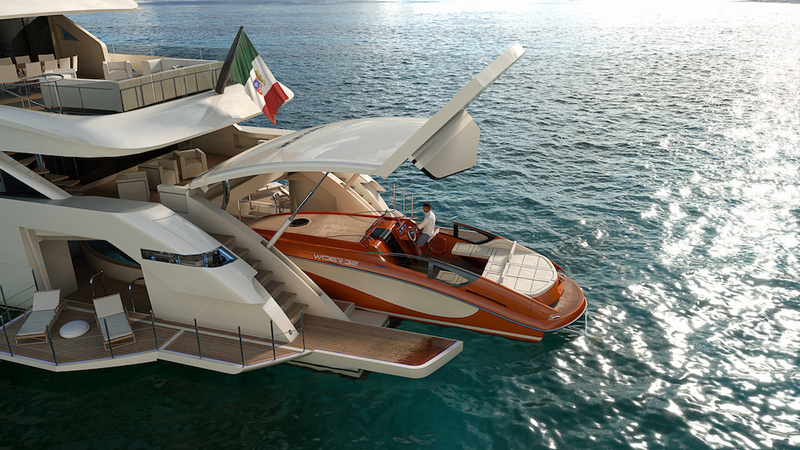 The yacht has a maximum speed of 14.5 knots. Also available at Zero Emission Speed, the WIDER 165 can run solely on batteries for silent cruising at lower speeds (5 knots), or for short movements, avoiding the need to start generators to move anchorages or for early starts. 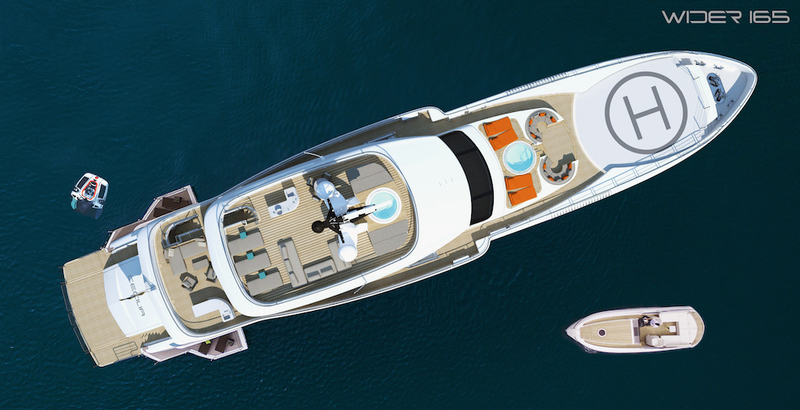 As with all of the WIDER Superyacht range, the onboard power sources are controlled by the WIDER Power Management System, a smart and fully integrated system which controls the power supplied by the shore connection, the gen-sets and the battery packs, distributing it between the hotel requirements, the propulsion system and the recharging of batteries, as required. 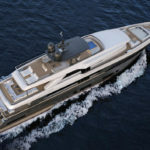 The yacht’s intelligent design focuses on minimising fuel consumption and emissions while maximizing onboard living space, without underestimating the importance of easy maintenance. The material chosen for the entire construction of the WIDER 165 is aluminum, a noble, durable metal that, being particularly lightweight, makes it possible to increase the performance/consumption ratio of the yacht and hence achieve a considerable reduction in emissions. Combined with the fact that aluminium is completely recyclable, this helps to reduce the vessel’s footprint on the environment. Aluminium also provides greater freedom during construction as it increases the opportunity for customisation, yet considerably shortens production times. Thanks to the collaboration with the architects involved in the project, the interior design corresponds to WIDER’s mission of enhancing the connection of the owner and guests to the water at all times through the use of large windows, side-opening balconies and spacious exterior dining and entertaining areas. Architects at IdeaeItalia have worked closely with Tilli Antonelli in order to obtain very bright interior spaces combined with warm colours, linear and clean design matched with a perfect balance of wood, glass and leather together with some more ornate details linked to oriental culture, reflecting the taste and background of the owner. 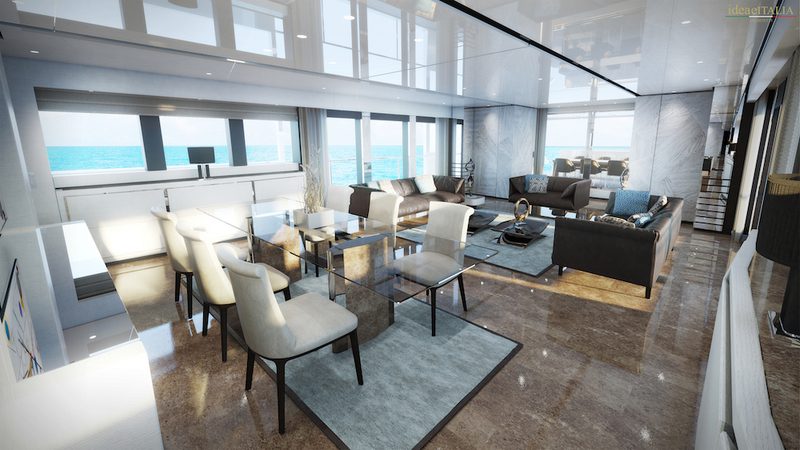 The choice of materials used onboard are primarily deep sanded oak, roman travertine stone, premium quality leathers and Italian white marbles. These have been elegantly combined to give a contemporary styled interior with a distinct Italian flair. 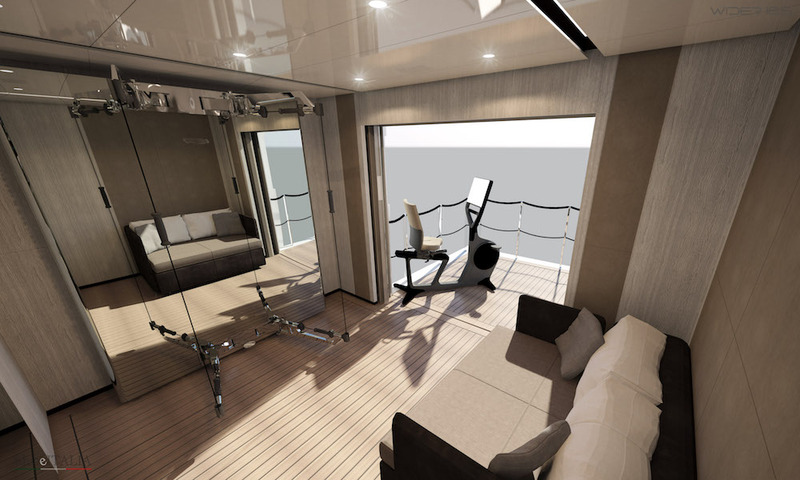 Among the many unique features on board the WIDER 165 are the owner’s private terrace overlooking the sea, which opens off the full-beam master cabin. The sizeable guest quarters comprise four en-suite cabins on the lower deck. The crew of 11, are divided among five cabins on the lower deck and a sizeable cabin for the captain next to the wheelhouse. An ample crew mess complies with the latest standards (LY3) for crew. A central corridor gives direct access to the engine room, located at the furthest point from the guest accommodation. 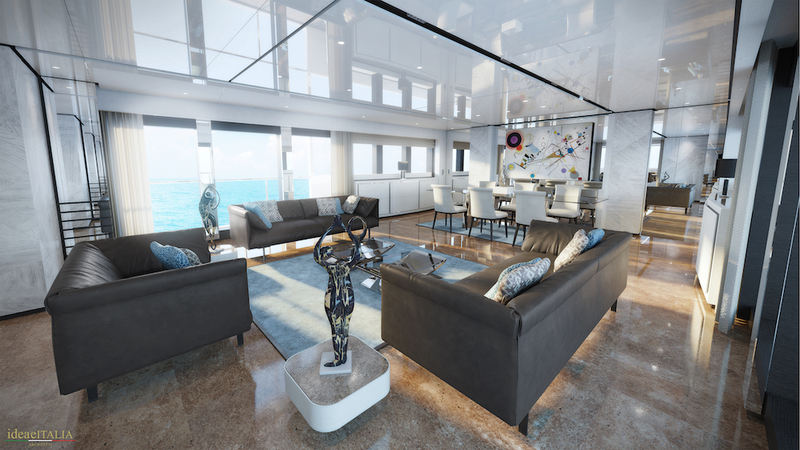 “Our new flagship will represent the finest marriage of aesthetics, innovation and cutting-edge technology that the yachting world has seen so far,” Tilli Antonelli said. This yacht is on track to be delivered to her owner in mid 2017.